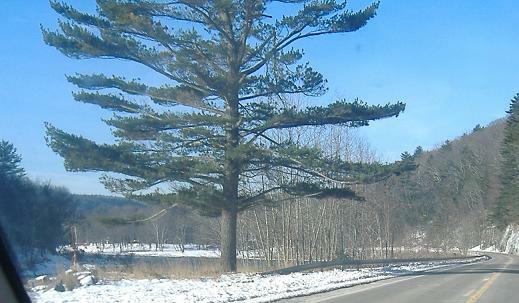 NY 42/97 just north of US 6/US 209. 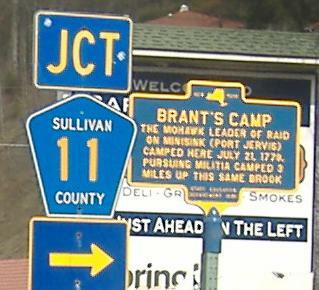 Main St. in Sparrow Bush (old NY 97/42, a continuation of West Main St. in Germantown as linked at the bottom of the page), WB at NY 42 and then across it onto the old concrete highway that used to tie Main St. into the part of NY 97 still a state highway. 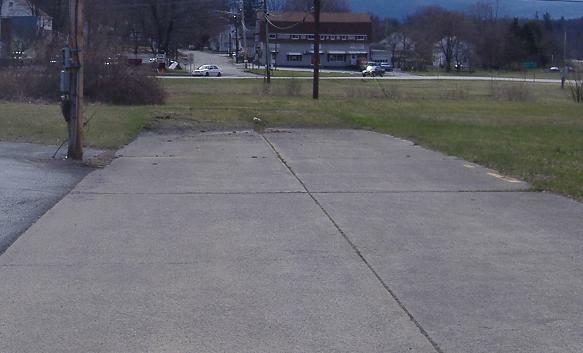 The third photo looks back east from the abandoned road toward Main St.
An old look at that area in 1972, courtesy Michael Summa. 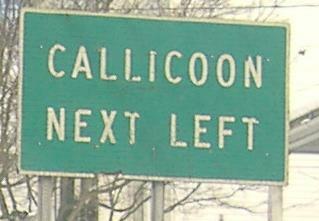 Back then it was a divided four-lane highway that then merged back into two lanes straight ahead. 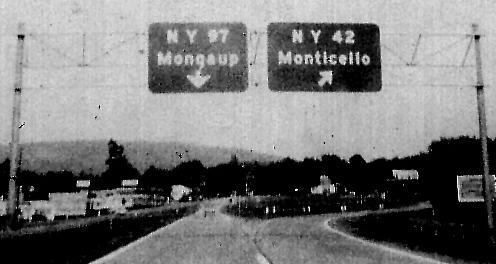 The traffic just didn't warrant it at this point, probably due to the continuing improvement of NY 17 and the completion of I-84. Based on the alignment I see here, I still think the Main St. stub isn't the former WB lanes - it appears the lanes have been converted into grass. 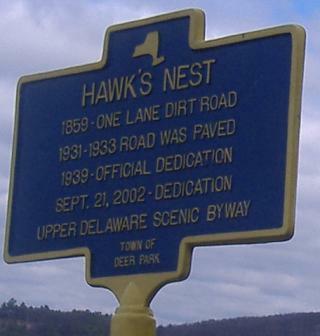 The Hawk's Nest, this wonderfully twisty road that sets hearts aflutter, towering high above the Delaware River. The only south-facing photo is the last one. 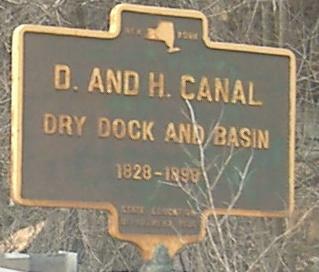 Continuing NB to Sullivan CR 41, where the main attraction is the bridge that's much older than this sign, and much more likely to fall down within the next few minutes. I drove it in both directions, only because once I was partway across, I was too scared to risk stopping, and once I was across, I had to get back. The "Old NY-PA bridges" link at the bottom of this page shows you what a wonderful bridge this used to be, and definitely no longer is. 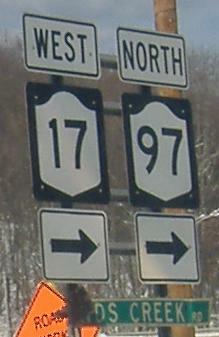 Plenty of old northbound stuff, interrupted by a perfect keystone and less-than-perfect CR 11 shield. 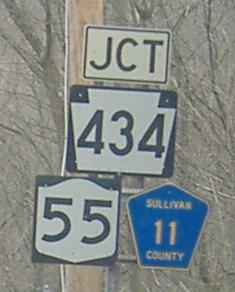 NY 55 begins here as a county-maintained road, and travels many miles as such before leaving Putnam County and gaining state maintenance. I accidentally shot this as video, but grabbed a screencap of the old SB LGS at NY 55. Oh, come now. 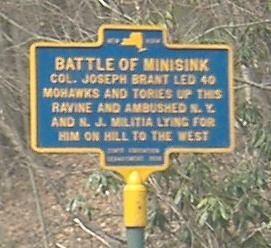 These are all within a few dozen feet of each other in Minisink Ford, on both sides of the highway. 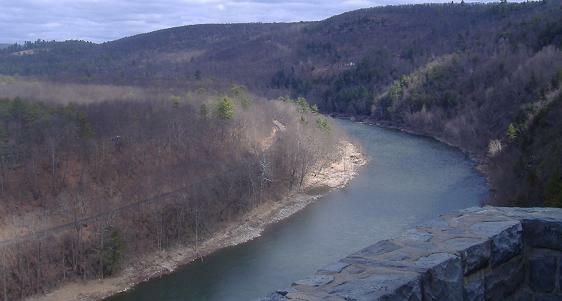 The Roebling Bridge is also in Minisink Ford, one of the first suspension bridges ever erected (thanks to that amazing pioneer of bridge construction), the oldest wire cable suspension bridge in the U.S., and the only surviving bridge for the Delaware and Hudson Canal, which crossed the Delaware River here into Pennsylvania and had a few more bridges. Yes, back in the day, rivers crossed you on bridges, not the other way around. It's like an "In Soviet Russia" joke, but the joke's on us. 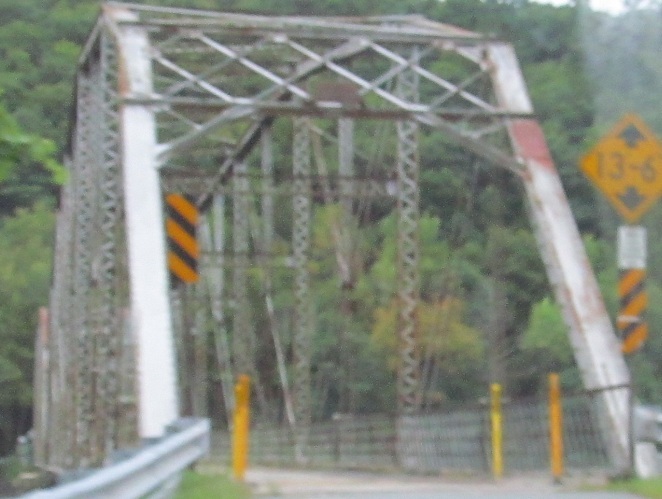 To see much more of this bridge, visit the "Old NY-PA bridges" link below (I exhort you again). 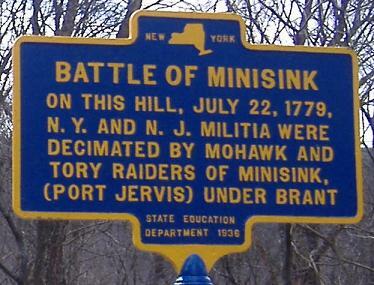 This photo is ALSO in Minisink Ford - well, was, possibly in 1972. NB courtesy Michael Summa. Continuing NB along the river. 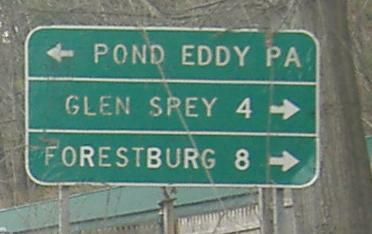 Is it a coincidence that NY 52 becomes PA 652 across the border? 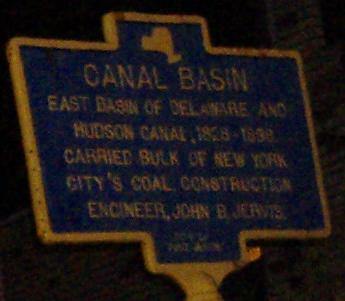 Well, it used to become US 106 (which ended midspan across the river), but when that route was killed, instead of turning the whole thing into PA 106, 106 was chopped into sections and only one piece kept the number. Since a number ending in 52 was available, it wouldn't surprise me if that was the reason for choosing it for this part. 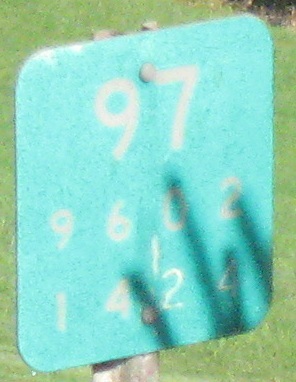 The shield appears to be as old as the renumbering, which again doesn't surprise me because NYSDOT doesn't make PA shields - it would have to buy another from PennDOT. 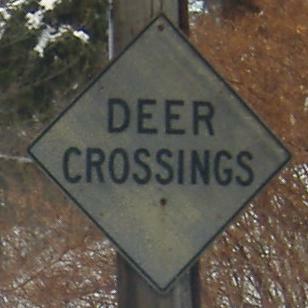 I didn't know deer picked out crossings in a discrete manner. 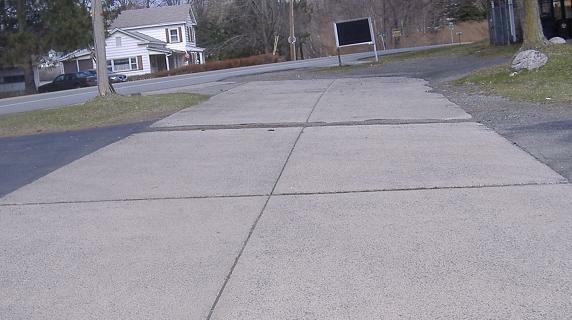 I always figured the entire stretch of road qualified as one crossing. 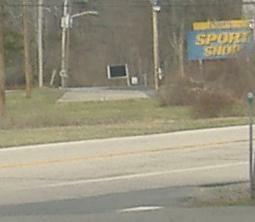 These old signs are all NB, culminating at Hoolihan Brook Rd. 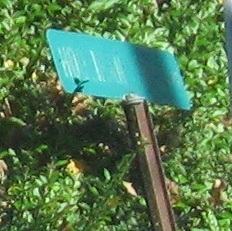 ("HOO") in Long Eddy. 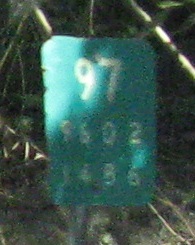 NY 97 SB just after it began, courtesy Doug Kerr, in Hancock. 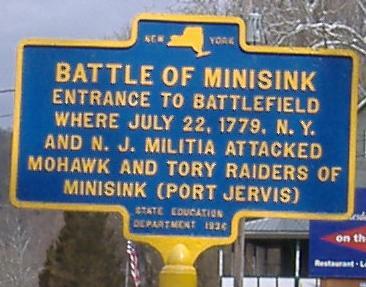 Actually, this was the original beginning of NY 97, and the road behind and ahead was part of the original NY 17. 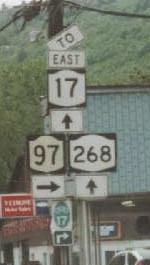 NY 268 originally began east of town, but now between 97 and 268, all of old 17 in Hancock is covered (except the dead-end west of town). 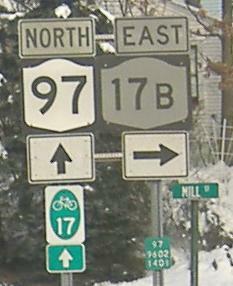 NY 97 NB just before it ends. 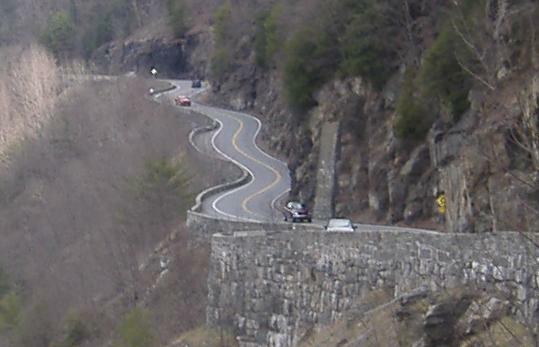 There's no point in signing it to the right, because the NY 17 WB onramp is all she wrote for the route.